I know how it feels first hand to fall out of love with your wedding dress. You climbed through metres upon metres of silk chiffon, tulle and enough lace to stretch across several football fields… and back. You herded your entire bridal entourage to endless dress appointments and you peeked through many bridal boutique windows after hours hoping that The One would appear right before your eyes under the glow of a warm spotlight. Then, before you know it, the planets align and you find your gown. It’s beyond beautiful. It’s so ‘you’! You love it so much that you want to sleep in it that night. You pay the deposit and… you wait 6-9 months for the wedding dress fairies to stitch it together. Then finally, you receive a call that your dress has arrived. You’re equal parts excited and nervous about seeing your dress again. Will it fit properly? Will you still love it? If you were anything like me, you walked into the dressing room and your worst fears were realised. You didn’t love your dress. In fact, it sat funny; you felt funny in it; and you hated it. Or perhaps what happened is you just spent the past 9 months browsing Pinterest looking at wedding dresses online and you’ve since changed your mind about the look you thought you’d go for. If this sounds like you, wipe away those tears and let’s cover some of the options. There’s ALWAYS options and it’s not the end of the world, I promise. For many, buying a new dress isn’t an option or if you do have the money, you probably don’t have the time or the emotional energy to look for another one. So, here are 6 tips which I hope will get you on your way to falling back in love with your wedding dress. And, to help you out, I’ve searched far and wide to find pretty additions online to help you on your way – good luck! 1.) Transform your dress with a glamorous capelet made from luxurious silk, fine lace or intricate beading. It’s incredible how a statement capelet, beaded bolero or lace topper can overhaul your entire bridal look. Not only do they create a striking silhouette from all angles but they’re oh-so-practical too. Great to cover the shoulders if you feel a little exposed and it’s a stylish way to shield yourself from the cool evening breeze at your reception. 2.) Chat to your seamstress about ways your dress can be customised with straps to better reflect your new vision. Perhaps they can add some lace capped straps or a detailed and elaborate one shoulder strap for a dreamy look. Your straps can either be practical to hold up your gown or decorative… think gracefully draped off the shoulder for a relaxed luxe vibe. 3.) Add lace sleeves to transform your look in an instant. Say goodbye to the traditional and the classically simple and hello to a vintage-inspired modern day gown which you will love to wear. 4.) Add the perfect finishing touches with an exquisite mantilla lace veil, a chapel length drop veil with blusher or a unique birdcage veil. There’s nothing like a beautiful wedding veil to pull your bridal look together and accentuate the silhouette of your gown. 5.) Remember, you aren’t necessarily stuck with the silhouette of your wedding dress. Make an appointment with your seamstress and see whether she can transform the silhouette of your skirt. If your dress is too flowy and you want it to be more structured, your seamstress may be able to remove some of the excess fabric depending on your dress. If you are no longer keen on the voluminous ball gown style dress you originally fell in love with, simply changing the hoops under your dress can dramatically change the shape of your dress to better suit your vision. If your dress features a simple sheath silhouette, convert it into a whimsical masterpiece with a tulle overlay skirt. 6.) 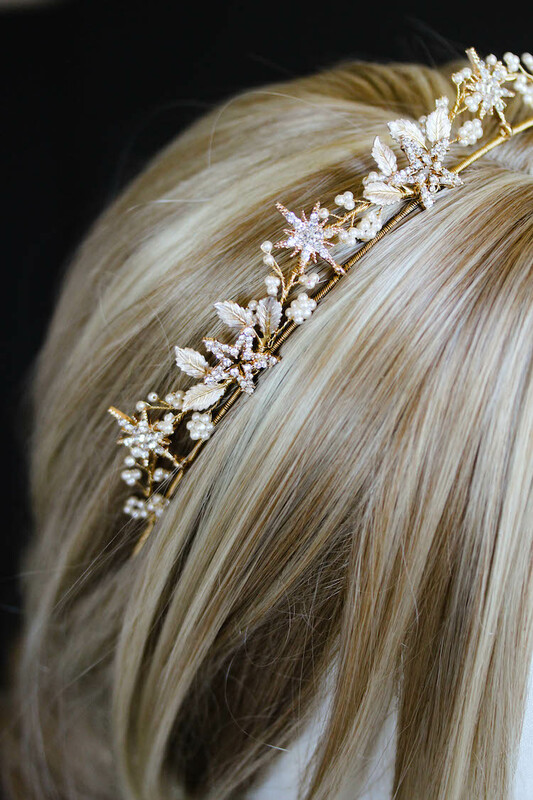 Find a timeless headpiece or have one custom made to match your dress. I’ve worked with many brides who don’t want to fiddle with the details on their dress which I completely understand. In this instance, focus on what you do love about your wedding dress and find accessories that accentuate those details. It might be the intricate beading, the ruched waistline or the neckline which shows off your shoulders and frames your face. Your accessories shouldn’t detract from your gown but they should highlight your best features while showcasing the distinctive lines and characteristics of your gown. At the end of the day, you should feel on top of the world on your wedding day. But remember, it’s not necessarily your dress which will make you feel like a princess. You will look and feel beautiful no matter what you wear if you wear your gown with pride, a confident smile and knowing that your beloved will be waiting for you at the end of the aisle. He’ll be marrying you, not your dress. And to finish off – if you’ve lost a lot of weight, you’ve put on weight or you just hate every stitch of your wedding dress, you can always find an ‘off the rack’ dress or perhaps an amazing pre-loved wedding dress from Savvy Brides or Still White.